Is there no end to the Angry Birds franchise? Rovio’s executives must be laughing all the way to the bank, what with the super popular bird flinging game making its way across numerous platforms, while merchandise that feature these upset avians continue to sell like hot cakes, without a care and concern of which country you are living in. GEAR4 knows a good thing when they see one, and want to ride on the Angry Birds wave with the Angry Birds Tweeters. These are not tweeters that you find in speaker systems, but rather, will be lightweight headphones that feature a flurry of Rovio’s popular game characters including the Red Bird, Black Bird, Blue Bird, Yellow Bird, and their eternally evil (yet cute looking) nemesis, the notorious Green Pig. Depending on which side of the pond you live on, the Angry Bird Tweeters will retail for $24.99 a pop, although those living across the Atlantic will have to fork out £19.99 for it instead. It might look cute and all from the outside, but does it have what it takes on the inside to deliver the audio quality that you want? Perhaps, considering the Angry Bird Tweeters will feature a 9mm driver, allowing you to clearly hear the full range from cymbals to bass regardless of the track you’re listening to. I suppose it will not matter all that much simply because those who want a pair of this would most probably use it most of the time listening to the in-game soundtrack and sound effects, and surely you do not need high end models to enjoy that experience. 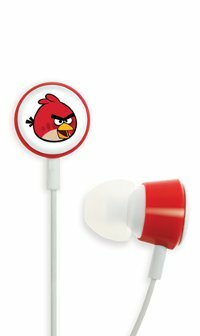 GEAR4 brings in their expertise of audio products with the Angry Birds Tweeters by designing the headphones with a soft tip in order to completely seal the ear canal so that you will be able to enjoy a better music listening experience. You can choose from three sizes of earbuds – small, medium and large, so it ought to fit most folks’ ears without missing a beat.